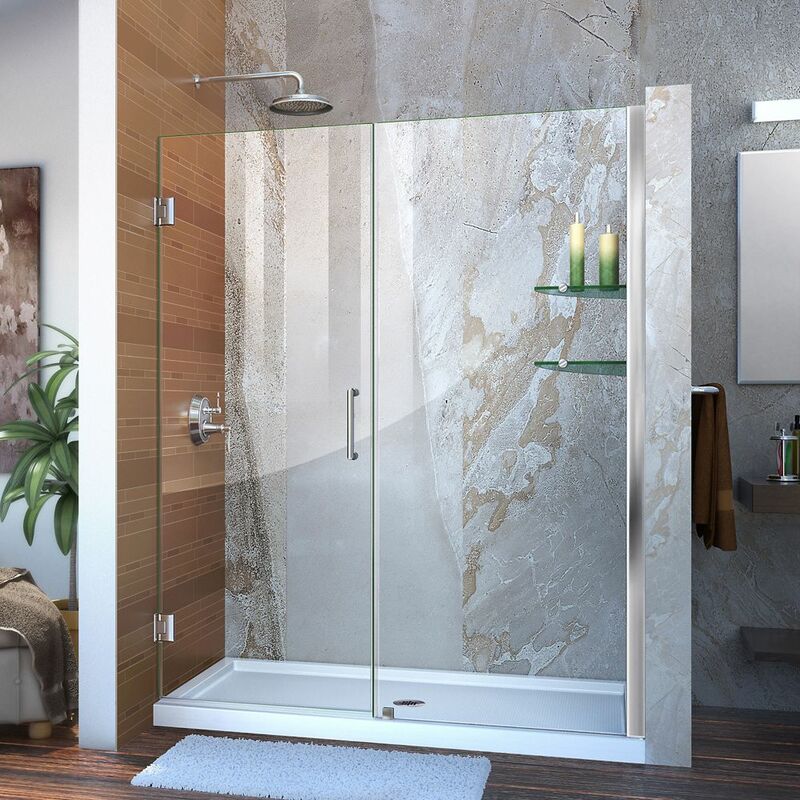 Unidoor 57 to 58-inch x 72-inch Frameless Hinged Pivot Shower Door in Chrome with Handle is rated 4.4 out of 5 by 8. Rated 5 out of 5 by HomeDepotCustomer from Appearance is exceptional and a quality product. Installation instructions well... Appearance is exceptional and a quality product. Installation instructions well done and made installation go well. Rated 5 out of 5 by Blake from It looks and works great. It was easy to... It looks and works great. It was easy to install and met all my expectations. Rated 5 out of 5 by Lisa m from GREAT CUSTOMER SERVICE!! Bought this shower door in 2012. The brackets which hold the door loosened and could not be fixed. Called customer service and they promptly replaced the brackets at a reasonably discounted price. They also threw in some bolts which hold the shelves in for free! Items arrived promptly at my doorstep. Thank you Dreamline! Rated 5 out of 5 by Pops from More then I expected Yes I bought this GREAT shower enclosure 1 mo ago ,I installed with 1 additional person. what a great product, and the price out of sight. Rated 5 out of 5 by Lincoln09 from The icing on the cake ! The Unidoor provided an absolute great finish to our bathroom renovation. This is one fine product and a super value. Rated 4 out of 5 by dd from looks great Directions for mounting height regarding spacer at bottom were not clear, resulting in drilling 3/4" too high into my newly installed tile - not happy about that. Fortunately grout patched the hole and it's not too noticeable and overall it looks great. However, the directions need to be much clearer - have somebody read them that is NOT directly involved with the product so they can see objectively how it is interpreted, and include updated directions before you sell one more of these. Rated 1 out of 5 by Anonymous from Horrible Didn't meet my expectations quality wise!!!!!!!!! !